The American Association of Physician Liaisons (AAPL) is an organization of healthcare professionals actively engaged in or supporting physician liaison activities in the health care field. The goal of AAPL is to bring those who function in this capacity together for educational and networking opportunities. 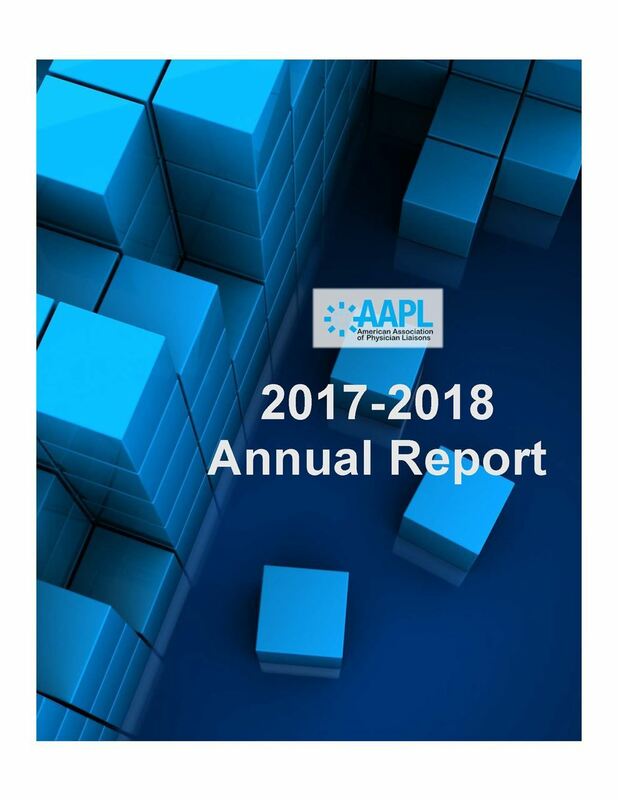 AAPL is proud to present their first Annual Report. Click Here to read reports from the President, Treasurer, Committee Chairs, and Executive Director. Inside, you will read stories shared by our board members and committee chairs, covering AAPL’s leadership endeavors over the last twelve months. Bylaws - Revised April 16, 2016 Please click HERE to view the PDF. CHARTER OF AMERICAN ASSOCIATION OF PHYSICIAN LIAISONS, INC. The name of the corporation is American Association to Physician Liaisons, Inc. The corporation's initial registered office is located in Davidson County, Tennessee. The name of the corporation's initial registered agent at that office is Ann Hollingsworth. This corporation will have members. Upon dissolution, any assets of the corporation will first be used to pay just debts of the corporation, they any balance, if any, will be given to a nonprofit corporation or association organized to further the healthcare system, such beneficiary to be determined by this corporation's board of directors. The purpose of this corporation is to bring those who function in a physician liaison capacity together for educational and networking opportunities, and for any other purpose that is lawful in the State of Tennessee.